Air compressor pump article provides guidence and review about application, type and prices. Air compressor is a device which stores energy in the form of pressurized air. Air compressor compresses the air into a smaller volume, and the compressed air is used to do the desired application. A compressor is a device used to pressurize air into vessels whereas a pump transfers the fluid or air from one place to the other. 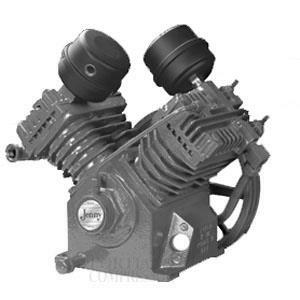 Air compressor pump does the function of the compressor mainly. As the compressed air is transferred to do the required work, people call them as Air compressor pump. They convert power from input sources like electrical, gasoline, etc. and stores it as potential energy in the form of compressed air. Air compressor usually works only on gases because liquids are hard to be compressed into smaller volumes. It compresses air into smaller volumes, and the compressed air is stored in a storage tank. Once the air is released the kinetic energy of the pressurized air can be used. Usually, the pressure limits are set, and the compressor pressurizes the air systematically once it falls below the desired limit. The compressor can be operated automatically for continuous and uninterrupted operation. Air compressor pumps operate with reciprocating piston action or rotary pump action. Air compressors are used in wide variety of applications in residential, domestic applications, factories, machines, automobiles, etc. The simplest example of air compressor pump is our bicycle pump, which pressurizes the air into a smaller volume and pumps them into our wheels. Then the compressed air provides us the suspension effect on roads during bumps and pits. Air compressor pumps are used in wide variety of appliances surrounding our home ranging from air conditioners, drillers, spray guns, paint guns, vacuum cleaners, etc. In factories and workshops, they are used in wide range of applications starting from drilling, nailing, grinding, painting jobs in machine shops and body shops, sandblasting, dry cleaners, car washing, air conditioners, and refrigerators. In automobiles, air compressors are used in air brakes for efficient braking. Air braking system reduces the stopping distance of a vehicle, and it gives more thrust to braking than normal hydraulic where our pedal force needs to be transmitted to braking. They are used in load carrying vehicles to operate their arms to lift and carry the load. They are also used in heavy vehicles when operating in rough and hard terrains for balancing the vehicle. They are used in various air engines from airplane plane engines to jet propulsion systems. Apart from these applications, they are also used in power plants, water purification plants, manufacturing industries, paint shops and irrigation purposes. Air compressors are classified based on various factors such as the type of the operation, compression stages, pressure required, pump power, etc. Here let us see in brief about the different types of air compressors. Reciprocating pumps- they are usually piston type pumps that operate in to and fro motion. And this type pump can be seen in our manual bicycle pumps. Rotary pumps – they are operating in a rotary motion by which air is compressed and transferred from one end to other. They are generally called as centrifugal pumps. These kinds of pumps are used in our clothes dryer. Single stage- compression takes place at a single cylinder or chamber. Multi-stage -compression takes place at two or more places in the pump. Low-pressure air compressors(LPAC) – discharge pressure of 150 psi and below. High-pressure air compressor (HPAC)– discharge pressure above 1000 psi. While ordering compressor, we need to consider following factors of the compressor. Power rating – we need to consider the power rating of the compressor for our application. Power is usually rated in the units of Horse Power(HP). Air compressors pumps have power range as small as 0.5 HP to some 400-500 HP pumps. Usually, air compressor pumps of range 1HP- 40 HP is used. Pressure requirement- Depending on the pressure of air to be maintained. CFM - The rate and volume by which a machine can offer compression are measured in cubic feet per minute (CFM). CFM denotes the maximum quantity of air; a compressor can give at a required pressure level. Manufacturer – we have to look into manufacturers reputation and quality also. Price – we need assess the product meeting our price range. Warranty- depending upon the life span expectancy and warranty of the manufacturer. The air compressor pump price varies from 300 $ for a 3 HP power pump to 15000$ for a pump of the 30HP power range. Here is a couple of examples for pump price and specifications.